The Afghan hound is an ancient dog originally from the Sinai Peninsula in Egypt. The breed is mentioned in Egyptian papyruses, and pictures of dogs were discovered in northern Afghanistan caves more than 4000 years ago. The breed was kept well-protected for centuries and exportation was prohibited, but in the early 1900s, Afghans were introduced in Europe as contraband. Other names and nicknames of Afghan hounds include Tazi, Persian greyhound, Balkh, Barukhzy, or Baluchi hound. The Afghan is a sighthound, meaning he hunts by sight, using his extremely fast and agile running skills to catch prey. The breed was used as a shepherd, and also as a hunter of a variety of game, including wild goats, deer, wolves, and snow leopards. The Afghan’s natural abilities help him excel at hunting, sighting, tracking, herding, racing, lure coursing, and as a watchdog. The Afghan has been called "the king of dogs” with his noble, majestic, and elegant bearing. Afghan hounds are tall, standing from 24 to 29 inches high, and weigh 45 to 60 pounds. The Afghan coat may be any color, and he may have a black facial mask or facial hair that resembles a Fu Manchu moustache (called “mandarins”). His coat is long and fine. The long topknot and shorter-length saddle of hair on his back add to his distinctive style, as do his high hipbones and the ring on the end of his tail. Needless to say, the Afghan’s gorgeous full coat needs careful attention. It’s not recommended to brush this breed between baths, because brushing a dry coat will damage the fur and cause it to mat more easily. Some Afghan guardians use what is called a pin brush to keep their dog’s coat in good condition. You should bathe your Afghan when necessary, and while weekly baths may not be necessary, they do help keep the coat less matted. 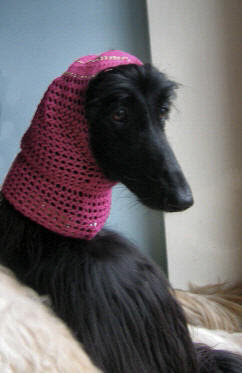 Many Afghans wear snoods much of the time to keep their ears from getting into their food and water bowls. Despite their long, fine coats, Afghan hounds are average shedders. This breed is described as courageous, dignified, and spirited, but also sweet, loyal, affectionate, and sensitive. Afghans aren’t dominant dogs, but they can be somewhat aloof, especially with strangers. They are easily socialized, and should be trained in a gentle, calm, but firm manner. Your Afghan will need clear guidelines and expectations and consistency in handling, as he isn’t generally motivated by food, nor does he have a strong desire to please you, unlike many other breeds (for example, the Golden Retriever). As is the case with many sighthounds, the Afghan has a high prey drive and may not get along with small animals. Some Afghans are known to be difficult to housebreak. They can also be timid and anxious without adequate mental and physical stimulation. Your Afghan will need a long daily walk or jog, which will help prevent behavior problems. He’ll also very much appreciate regular opportunities to run off-leash in open, safe areas. Afghans are generally healthy, but can be prone to allergies, cancer, hypothyroidism, and hip dysplasia. This breed also shares a heightened sensitivity to anesthesia with other sighthound breeds due to their low levels of body fat. Afghans are also predisposed to chylothorax, a rare but serious disorder involving the thoracic ducts. The Afghan hound has a lower pain tolerance than other dog breeds. A minor injury will be more bothersome to this dog than others, which at times can make him appear whiny. Afghans are considered a rather quirky breed in general, but one trait that doesn’t get a lot of attention is this dog’s propensity for stealing. If he sees it and wants it, he’ll find a way to have it. Afghans have been known to swipe food right out from under their owner’s nose, and find incredibly creative ways to get into forbidden areas of the house. Also, there’s no point in trying to keep your Afghan off comfy furniture. He thinks he belongs there, and who are you to argue? These dogs have also been known to push their owners out of bed. When stressed, many Afghans simply go to sleep until the uncomfortable situation has passed. Others develop a runny nose when worried or excited. Afghans have a reputation for being low achievers when it comes to “working” or “obedience” intelligence. What’s important to know is that working intelligence isn’t a measure of how smart a dog is. Dogs bred to work side-by-side with humans will be easier to train than dogs like the Afghan, who evolved as an independent hunter. Some people feel an obedient dog is smart, while others believe a dog with a mind of his own is more intelligent. Very agreeable dogs are considered smart by most human standards. Dogs like the Afghan who are bred to be more independent and less eager to please are not dumb, but they do often require more patience when it comes to learning and following commands. There are breed specific rescue organizations throughout the U.S. if you decide you would like to personally meet one of these unique dogs. Previous Article Slo-Mo Puppy Attack!